One month of Unlimited Bikram hot yoga, yoga nidra & yin yoga at BYC hot yoga. Ideal if you are coming 3+ times a week! 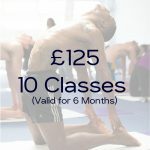 £140 for 31 days of yoga. PLEASE NOTE: You have a month from date of purchase to activate. Once activated, the card is valid for 31 days. Have you thought about our 12 Month Autopay, at £99/month for unlimited yoga! If it is the commitment that is making you hesitate you might be interested to know there is a 2 month cancelation policy so if you need to cancel before the 12 months is up, just give your 2 months notice, practise as normal & your done!